Ap EAMCET , Engineering, Agriculture and Medical Common Entrance Test (EAMCET) is conducted by Jawaharlal Nehru Technological University Kakinada on behalf of APSCHE. This examination is the prerequisite for admission into various professional courses offered in University/ Private Colleges in the state of Andhra Pradesh. 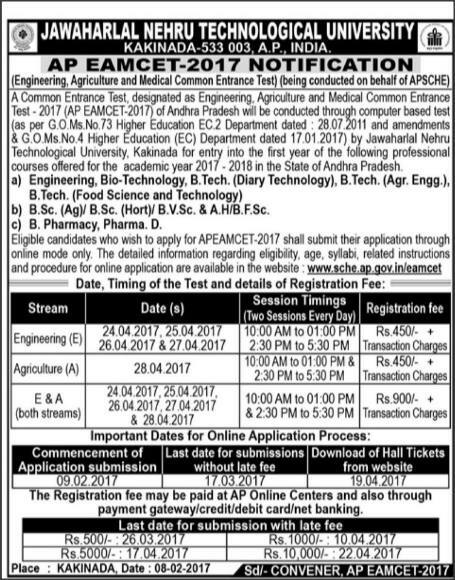 Eligible candidates who wish to apply for AP EAMCET 2017 shall submit their application through online mode only. The detailed information regarding eligibility,age,syllabus,related instructions and procedure for online application are available in the website.